"Jake was steadfast with me and helped me settle when other attorneys did not try or did not care." Vicki P.
Though it is not always easy to think about, we cannot live forever. What will happen with the things and people we leave behind? Whether you have a large estate and many heirs or a small estate and no heirs, it is important to plan for the future. Too many times, people fail to draft a last will and testament. As a result, valuable assets are lost, precious time wasted and family relationships damaged. 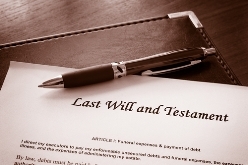 When a person dies without a will, this is known as dying intestate. Each state has specific laws and rules about how to address the intestate succession of an estate. The laws in Illinois and Missouri divide an estate up among surviving relatives. In the rare cases where no surviving blood relatives can be located, the assets will be turned over to the state. The only assets that are not subject to intestate succession are those with named beneficiaries or shared accounts. A life insurance policy with a beneficiary, a joint bank account, a home owned with another person or any account with transfer-on-death stipulations fall to the person named on the account and are not considered intestate property. Why Draft a Will If the State Will Divide the Assets? The deceased person does not get to decide who inherits. In both Illinois and Missouri, intestate succession goes down the line from spouse to children to parents and siblings to other blood relatives. Close friends or loved ones cannot inherit, and blood relatives inherit even if they had no social or personal relationship with the deceased. The deceased person does not get to decide how much a person inherits. Additionally, the state determines how much is given to each person who stands to inherit. In cases where the deceased was married with children (from that marriage or other relationship), the estate is divided with half going to the spouse and the other half divided among surviving children. A husband may want his wife left with more than half the estate, or issues can arise when the children are from previous relationships. The state will determine an executor. The state will appoint a person to act as executor for the estate. This person may not be the most qualified nor the person the deceased would want to manage his assets. Family relationships can be damaged. When assets are not left specifically to individuals, disputes can arise. Children may fight over assets with each other or a surviving spouse. Other blood relatives may seek a portion of the estate. This can lead to family rifts that may never be resolved. Assets can be lost in legal disputes. When the assets are disputed, costly legal action may take place. Probate is a common practice and can bleed an estate of valuable assets, in addition to taking time to resolve. Wills are appropriate for any type of estate. They are relatively inexpensive to draft and can save families time, money and discord during an already challenging time. If you have questions or are interested in devising a will to protect your family’s future, contact the experienced legal team at the Tapella & Eberspacher Law Firm today at 855-522-5291.